Everypost is a free social networking app for Android and iOS devices. It allow users to submit post on multiple social networks simultaneously quickly and easily. Everypost.me is quite useful especially for celebrities to update their fans in no time and, for bloggers like me. Because after publishing an article it took me approximately ten to twenty minutes to update Techij official pages on different social networks including Google+, Facebook, Twitter, Pinterst, etc. via smartphone. 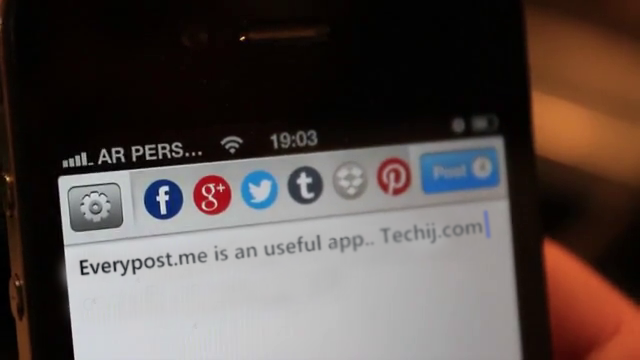 But now with Everypost mobile application it becomes so easy to submit post on multiple social networks simultaneously. The feature which I liked most is via Everypost.me you can go over 140 characters in twitter. Moreover you can apply filter to your photos before sharing, can save your multimedia content in Google Drive (android users) and Dropbox (iOS users), can browse Flickr and YouTube to attach photos and videos, respectively in a post to share on Facebook, Twitter, Pinterest, Tumblr, LinkedIn, Google+, Dropbox, etc. absolutely free. Requirements: Android 2.2 or later and, at-least of iOS 5.0 or later.